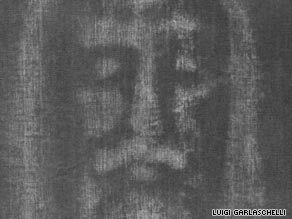 (CNN) -- An Italian scientist says he has reproduced one of the world's most famous Catholic relics, the Shroud of Turin, to support his belief it is a medieval fake, not the cloth Jesus was buried in. Luigi Garlaschelli says his reproduction of the shroud disproves the claims of its strongest supporters. Luigi Garlaschelli created a copy of the shroud by wrapping a specially woven cloth over one of his students, painting it with pigment, baking it in an oven (which he called a "shroud machine") for several hours, then washing it. His result looks like the cloth that many Christians through the centuries have believed is the actual burial shroud of Jesus, he told CNN. "What you have now is a very fuzzy, dusty and weak image," he said. "Then for the sake of completeness I have added the bloodstains, the burns, the scorching because there was a fire in 1532." Garlaschelli says his work disproves the claims of the shroud's strongest supporters. "Basically the Shroud of Turin has some strange properties and characteristics that they say cannot be reproduced by human hands," he told CNN by phone from Italy, where he is a professor of organic chemistry at the University of Pavia. "For example, the image is superficial and has no pigment, it looks so lifelike and so on, and therefore they say it cannot have been done by an artist." His research shows the pigment may simply have worn off the cloth over the centuries since it was first "discovered" in 1355, but impurities in the pigment etched an image into the fibers of the cloth, leaving behind the ghostly picture that remains today. "The procedure is very simple. The artist took this sheet and put it over one of his assistants," he said. "His good idea was to wrap the sheet over the person underneath because he didn't want to obtain an image that was too obviously a painting or a drawing, so with this procedure you get a strange image," said Garlaschelli. "Time did the rest," he said. He undertook the research out of personal interest, he said. He described himself as a rationalist, but said he is not specifically anti-religious. "I am not a believer, but I am first of all a curious person, and I like to investigate these mysteries, not necessarily related to religion," he said. "It's not my fault if in Italy most of these paranormal facts are related to religion. If the church would like to fund me (to do research), I am ready." The Shroud of Turin is a linen sheet more than 14 feet long and 3 feet, 7 inches wide that carries an imprinted image of the front and the back of a crucified man, according to the Catholic Archdiocese of Turin. "The imprint shows the peculiar characteristics that usually belong to a photographic negative," says the Web site of the shroud, which is maintained by the archdiocese. The Vatican does not have an official position on whether the relic is genuinely the cloth Jesus was buried in after being crucified. "Since it is not a matter of faith, the church has no specific competence to pronounce on these questions," the late Pope John Paul II said in 1998. Carbon dating in the 1990s suggested it dates from the Middle Ages. But John Paul II insisted it is important to learn lessons from the relic, whether or not it is genuine. "The imprint left by the tortured body of the crucified one, which attests to the tremendous human capacity for causing pain and death to one's fellow man, stands as an icon of the suffering of the innocent in every age," he said in an address at Turin Cathedral, the home of the shroud. "Before the shroud, how can we not think of the millions of people who die of hunger, of the horrors committed in the many wars that soak nations in blood, of the brutal exploitation of women and children, of the millions of human beings who live in hardship and humiliation on the edges of great cities, especially in developing countries?" the pope asked. The Vatican has not responded to Garlaschelli's research, which was funded by the Union of Rationalist Atheists and Agnostics, he said. He dabbled on the project for years, he said, starting with handkerchief-size pieces of cloth and different combinations of acid and pigment, before making his shroud this summer. Now that he knows how to do it, he could make another one in about a week, he estimated. The greatest expense was having a cloth specially woven to mimic the shroud, he said. He did not have access to the shroud itself, which is usually kept in a special chamber, away from public view. "Only a few very chosen persons have direct access to it," he said, adding he had relied on "the published data" about the relic. He is due to present his findings Saturday at a conference of the Italian Committee for the Investigation of Claims on the Paranormal. He has also written a 50-page paper that he hopes to publish in a scientific journal. The real Shroud of Turin is due to go on display to the public in April and May of 2010. It was last put on public view in 1998 and 2000, but has undergone extensive restoration since then, including removing a backing and patches added over the centuries.